An occasional single poisonous snake can be destroyed if one has enough determination. In areas where the habitat is favorable for rattlesnakes, copperheads, or water moccasins, a significant reduction in their population density may be difficult. In snake country, most people learn to “keep their eyes open” and be cautious. When feasible, the most effective way for a homeowner to protect a child’s play area from rattlesnakes is to construct a rattlesnake-proof fence around it. The fencing must be tight. If wire mesh is used, it should be 1/4-inch mesh and about 3 feet high. Bury the bottom 3 or 4 inches or bend outward 3 or more inches of the base of the wire to discourage other animals from digging under the fence. Put the stakes on the inside and install a gate that is tight-fitting at the sides and bottom, equipped with a self-closing spring. The benefit of the fence will be lost if wood, junk, or thick vegetation accumulates against the outside of the fence. Vegetation that has ground-level foliage also provides attractive hiding places for rattlesnakes, so it should be removed or properly pruned. Tight-fitting doors will prevent snakes from entering outbuildings. The foundations of all buildings should be sealed or tightly screened with 1/4-inch wire mesh to keep out snakes. No effective toxicant is registered for the control of rattlesnakes. 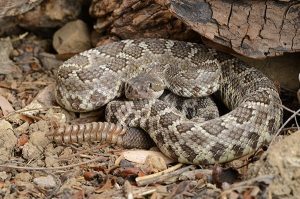 It may be possible to kill rattlesnakes in burrows and rock dens with toxic gas, although this is not a very practical method. Various combinations of fencing and traps at known rattlesnake dens can be very successful if one is trying to collect rattlesnakes. If you are in need of snake control in Southern California, do not hesitate to reach out to us at Wildlife Removal Services. We will affordably provide you with snake removal services in a short amount of time!